Read classic literature from the eyes of the dinosaurs, and learn about the literary greats through humorous, prehistoric mashups and fun, dinosaur-themed facts. Jurassic Classics: The Prehistoric Masters of Literature mixes prehistoric dinosaur humor with some of the great names of literary history to teach the classics in a fun and inviting way for children of all ages. 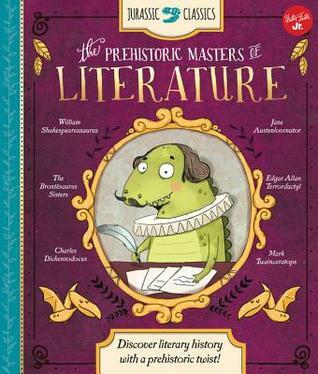 The first book in a new series, The Prehistoric Masters of Literature, features an assortment of well-known, classic authors, such as the Bronte sisters, Jane Austen, and William Shakespeare, all under the guise of favorite dinosaur mashups (i.e. the "Brontesaurus" sisters). The Prehistoric Masters of Literature features a brief "dino" biography of each author, with real facts intertwined and modified to fit with the prehistoric theme. Each biographical spread also includes a short mini book of one of the author's classic novels, glued into the last pages. For instance, an abridged version of Wuthering Swamp Heights is included alongside the Brontesaurus sisters' biography. With the timeless popularity of dinosaur subjects for children, this new series is sure to engage and delight, as well as teach children about famous figures in history. I wasn't sure what to expect when I picked up this book. I mean dinosaurs and classic adult literature? How could that be child friendly I wondered. But it turns out that it works surprisingly well in this case. Turning each author first into a dinosaur and then including a brief mini book tweaked to be about dinosaurs made for some amusing reading. This book actually provides an interesting introduction to authors that children will definitely run into later in their lives including: William Shakespeare, Jane Austen, Emily Bronte, Edgar Allan Poe, and Charles Dickens. After each 'dino' biography and mini book selection there is a brief biography of the real person and what he/she is best known for writing. 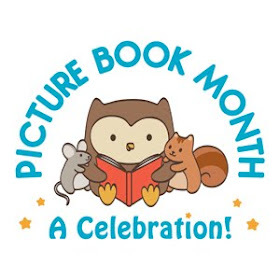 I actually really enjoyed reading this and think it would work well for children being introduced to these classic authors for the first time. That does not mean that the child is necessarily ready for reading the classics themselves, just being introduced to it for the first time. Reading and understanding the classics does of course depend on age, maturity, and the child him/herself in terms of readiness to understand the themes and content. Looks cute. I think my 8 year old twins would love these! Thanks for the chance at a giveaway.